I won't make a list of the characters this guy is sort of kind of based on but suffice to say, I love asymmetry in designs and am all too happy to introduce it to my own. He looks awesome, great job on him. Asymmetry makes everything feel more natural, and that plays a big part in how real this character feels. Now if only I could bring him along for the ride in my own game. COUGHCOUGH. Keep up the good work. Your characters are always a breath of fresh air. I intend to release him as a follower, wont be on Nexus. When I do I’ll serve up a link here though. He looks like a fully fledged NPC. 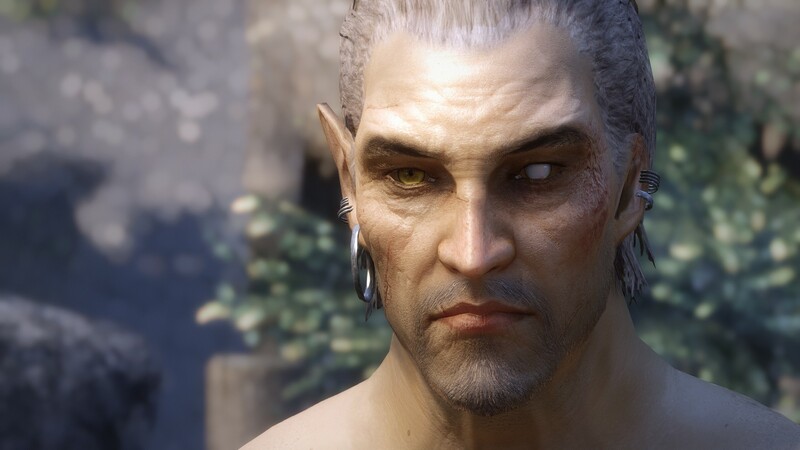 I hope the character design is anywhere near this good in future Elder Scrolls games. His textures are from the Dizona Body mod that released here on Nexus a short while ago, plus some resources from here and there on the web. Though I did create his specular maps myself, directly from the diffuse (the default ones I found were too shiny). I do love ol’ Nar! ShinglesCat did such an amazing job with him, he’s one of my favorite followers. Yep he was and is an inspiration to me. He definitely looks like he's been through the Great War (and a few more). Nice rough character and great shot!